+SPD: A boon in Speed is a fantastic choice for Lucina, as it boosts both her offensive and defensive capabilities by allowing her to better perform and avoid follow-up attacks. +ATK: A boon in Attack is always helpful, as it boosts Lucina’s raw damage in both Player and Enemy Phase. DEF: Lucina prefers to keep her Defense neutral in order to keep her solid physical bulk of 71 (with Geirskögul equipped) intact. However, raising it is not a bad idea either, as it comes with a superboon. HP: Similarly, Lucina prefers to keep her HP neutral in order to keep her overall bulk intact, though a bane may help in the activation of skills such as Wrath. -RES: Resistance is Lucina’s weakest stat and the best bane that she can receive, as dropping it further will hardly affect her overall performance. This set aims to make Lucina an effective Enemy Phase combatant as well as a fantastic support with her unique weapon, Geirskögul. In addition to Attack and Speed which grant Lucina more damage and the ability to better avoid follow-up attacks respectively, Defense also makes for a suitable choice of boon by making her more resilient to physical attacks as well as adding additional damage into Defense-scaling Specials such as Bonfire and Ignis. For her Special, Ignis makes for a great choice thanks to Lucina’s solid Defense allowing her to deal consistently high damage upon activation. It also synergizes exceptionally well with Steady Breath by allowing her to potentially activate it every single round of combat as well as adding to its overall damage. Aether also makes for a good choice. While it comes at the cost of 1 additional cooldown and has lower damage potential than Ignis, its healing aspect allows Lucina to be a self-sustaining tank. Quick Riposte is an essential skill as it guarantees Lucina’s follow-up attack in the Enemy Phase. Alternatively, one can move Quick Riposte to the Sacred Seal slot in favor of running Guard as her B skill. Guard will greatly reduce damage taken from opponents that rely on activating their Special such as Ayra and Zelgius. This also applies to all armored units running Bold Fighter, as their follow-up attacks cannot be avoided if they initiate on Lucina, along with granting them additional Special charge. Both Drive Spd and Drive Atk pair well with Geirskögul by further boosting the Atk/Spd of all allies within 2 spaces. On a mixed team composition, any Tactic skills such as Attack Tactic also make for great buffing options. Otherwise, the C slot can be replaced as needed to accommodate the team. Moving on to Sacred Seals, Close Defense is a great choice for this Enemy Phase oriented playstyle, as it will reduce damage taken from all melee opponents when initiated on. If not already being used in the B slot, Quick Riposte seal is pivotal in allowing Lucina to consistently perform follow-up attacks in the Enemy Phase. Last but not least, the Quickened Pulse Sacred Seal makes for a great choice when utilizing Aether by allowing Lucina to activate it during her first round of combat. This build is geared more towards combat in the Player Phase while retaining the same value of support. As such, Lucina enjoys receiving a boon in key offensive stats such as Attack and Speed. For her Special, Luna makes for a great choice by being both strong and consistent in its activation. When combined with the Flashing Blade Sacred Seal, Lucina can potentially activate her Special on every follow-up attack. Alternatively, Moonbow’s shorter cooldown allows Lucina to activate her Special every round of combat even when Desperation is active but comes at the cost of less damage compared to Luna. Swift Sparrow makes for a fantastic choice on almost any offense-oriented set, as it provides a strong boost to one’s Attack and Speed without the need to forego anything else. Fury makes for another solid option; not only does it improve Lucina’s overall bulk at the cost of 2 Attack/Speed, the 6 damage recoil taken after combat makes it easier to get into the HP range of Desperation and Wrath. While Desperation itself is the centerpiece of many offense-oriented builds, Lucina’s solid physical bulk opens the door to additional options. Wrath bolsters Lucina’s offensive potential by increasing both the power and frequency of her Specials when under 75% HP. Chill skills such as Chill Spd and Chill Def also make for a great choice by providing strong debuff support for both Lucina and her teammates. However, these skills are somewhat inconsistent and may not always hit their desired target. Thanks to her high Speed, Lucina can make very effective use of the Flashing Blade Sacred Seal, boosting the rate at which she is able to activate her Special. For a more support-centric approach, Lucina can choose to run the Drive Atk Sacred Seal. Coupled with Drive Spd in her C slot, Lucina will provide a whopping +6 Atk/Spd to all allies within 2 spaces. Otherwise, Attack +3 and Speed +3 are good choices for providing Lucina with a solid offensive stat boost. Stemming from the “Choose Your Legends” popularity poll, this variant of Lucina comes in the form of a fantastic support-based unit. With her unique weapon, Geirskögul, Lucina is able to provide any physical teammate within 2 spaces a solid +3 to their Attack and Speed. However, Lucina certainly is no pushover when it comes to fighting herself. Statwise, Lucina’s strong values in Attack and Speed make her a strong offensive unit. While nothing standout, Lucina’s base Defense of 27 (30 with Geirskögul equipped) allow her reliably tank a majority of physical hits without taking heavy damage. Lucina’s greatest weakness is her terrible magical bulk. With only 19 Resistance and 60 magical bulk total, Lucina is susceptible to getting heavily chunked if not outright killed by magical-damage dealing opponents. 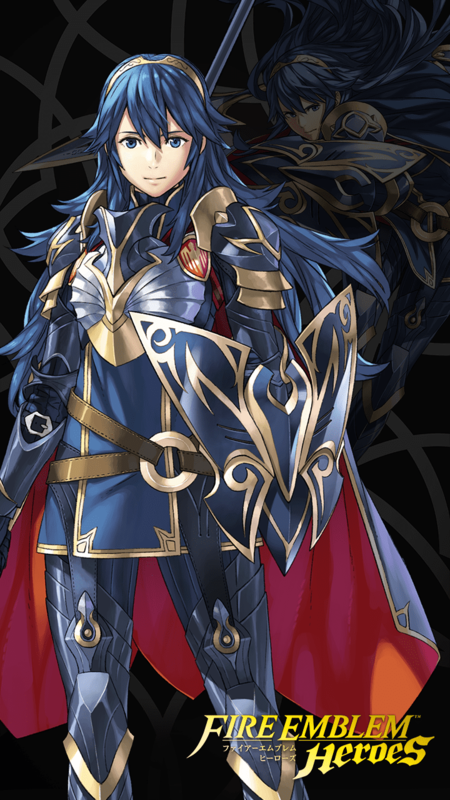 Overall, Lucina is a highly versatile unit thanks to her strength as both a buffer and a combatant, allowing her to fit well on a variety of teams. In addition to boosting her physical bulk, Lucina’s personal weapon boosts the Attack and Speed of physical allies within 2 spaces. Lucina’s 34/36 Attack/Speed spread make her highly proficient in taking out opponents in a single round of combat. Having only 60 magical bulk at base, Lucina will often take significant damage from Resistance-targeting attacks. Thanks to her role as a support unit, Lucina can fit well on almost any team. In particular, offensive-oriented units benefit the most from the buffs that Lucina provides. In order to keep herself safe, Lucina also appreciates having magically bulky allies that can tank hits while keeping her safe as well as red units that can cover her Weapon Triangle disadvantage. Finally, refreshers help Lucina through the extra turn they provide by allowing her to get into more favorable positions. Offensive Units: Since Geirskögul provides a boost to Attack and Speed, Lucina naturally pairs well with offense-oriented units such as Ayra, Karla, Raven, Nino, Ishtar, Tana, and Elincia. Magically Bulky: Winter Tharja, Katarina, Arvis, Sheena, Fae, Micaiah, and Lute are all strong allies, as they can tank magical hits while keeping Lucina safe. Strong Reds: Zelgius, Legendary Ike, Ares, Ayra, Lilina, and Summer Tana all perform well in checking both physical and magical greens that may pose a threat to Lucina. Refreshers: YT-Olivia, Bridal Ninian, New Year Azura, Lene, Performing Inigo, and Summer Micaiah are among many great choices that provide Lucina with fantastic support through an extra turn, allowing her to get into more favorable positions. Due to her aforementioned poor magical bulk, Lucina gets easily swept aside by strong magic damage dealers. Physically bulky green units also post a major threat, as they can mitigate the damage that Lucina is able to do, especially if they are running guard to prevent her from activating her Specials. Magical Damage Dealers: Nino, WT-Olwen, Reinhardt, Ishtar, Halloween Henry, and Bridal Sanaki can all make short work of Lucina’s sparse magical bulk. Physically Bulky Green: Hector, Fallen Male Robin, Winter Chrom, Myrrh, and Brave Ephraim can easily mitigate the amount of damage that Lucina can do thanks to their high physical bulk and Weapon Triangle advantage. In addition, units that utilize the skill Guard can completely wall Lucina off by preventing her from activating her Specials. S support with B!Roy, complements each other with weapon and movement type. Using pivot to increase movements or avoid situation. A good defensive unit who can pair well with Brave Ike. She should be taking the hits for him and countering while he steps in to finish off those that Lucina isn't killing on her own. She should also be able to competently pair up with other Brave Units. Not as bulky as Nephenee, but is faster preventing more doubles. Build playstyle is the same as Slaying Edge Ayra. May not be as strong due to 1 less speed and 4 less defense. Could opt for a +def superboon if you need more bulk to match Ayra but then you would have less speed and maybe attack (depending if Ayra&amp;amp;#039;s boon is +atk). Lots of bulky green units these days so as long as you have a solid answer for them, this build could work. Lucina can go support build, allowing her to boost ally offensive stat. Her default weapons 'Geirskogul' & passive skill 'Drive spd 2' give total support bonus of 6+ speed & +3 attack out of the box. By giving her Seal 'Drive atk 2' & support skill 'Rally speed', she can maximum overdrive boost ally by total of 10+ speed & 6+ attack. She pair well with Lucina or Mask marth as their Falchion (Awakening) (Refined) grants Atk/Spd/Def/Res+4 during combat if unit is adjacent to an ally which complement well with increase support stat from brave lucina's kit, allow them to out-speed most unit which work well when baiting in the enemy phase. Another Lucina to make the Steroids Lucina even buffer. She gives +6 atk/spd to all team members within two spaces. On top of that she can also fend for herself with the rest of her skills. Oh btw, she's +1. GeirskögulGrants Def+3. Grants allies with sword, lance, axe, bow, dagger, or beast damage, within 2 spaces Atk/Spd +3 during combat. DaylightRestores HP = 30% of damage dealt. SolRestores HP = 50% of damage dealt. Sturdy Blow 1If unit initiates combat, unit granted Atk/Def+2 during battle. Sturdy Blow 2If unit initiates combat, unit granted Atk/Def+4 during battle.